Went over syllabus .✔I showed them the syllabus and managed to go over scheduling of labs, partner work, and online texts, but did not get to some of the boilerplate about cheating and about disability services. ✘ Oh well, it is enough that the boilerplate is on the syllabus. Demoed pressure sensor ✘ with PteroDAQ on KL25Z board. I hooked everything up and it didn’t work. I fixed one problem of a loose wire (using the jeweler’s screwdriver, but it still didn’t work. I did manage to show them PteroDAQ and used gnuplot to show them a pressure trace I had recorded in the BME88A demo last quarter. Reading the book and doing design well before lab. Assigning reading due tomorrow and Thursday. Partners changing every week, so no one gets a free ride for very long and no one has to suffer with a freeloader. I was thinking that I’d use the chalkboard a lot, so I used the small screen in the classroom (this classroom is ridiculously over-equipped with projectors, even having a project for a screen at the back of the classroom) rather than the big one, which covers most of the chalkboard. But I ended up using the projector to show them parts of the book and to use the document camera to show the KL25Z board and instrumentation amp protoboard, and barely used the chalkboard at all. The rearrangement of the labs, with soldering on Tuesday, sampling and aliasing on Thursday, and the thermistor labs next week does give me a little leisurely start-up than last year, as I don’t have to get to Ohm’s law and Kirchhoff’s current law until the voltage-divider lecture on Friday. Overall, I’m fairly happy with how the first day of class went, despite the demo failure. I’ll debug the demo and show them either in lab tomorrow or in class on Wednesday. I just hope I haven’t fried the instrumentation amplifier with static—they’re expensive and I don’t know whether I have any spares on hand. Update 2015-Mar-30 17:58: When I got home I checked out the board to figure out what might be wrong. After probing for a while with the voltmeter, I determined that the wire that had come loose from its screw terminal and that I had fixed in class was not the only wire that had come loose. The one next to it had also come loose. It still looked ok, but wasn’t making contact. Opening the screw terminal, reinserting the wire, and tightening it down again fixed the problem. In Revised plan for circuits labs I provided a tentative schedule for the applied circuits course and lab, which I ended up not really following (dropping the FET measurements, moving the sampling lab after the loudspeaker lab, and swapping the order of the pressure sensor and the class-D amplifier). I’m now trying to turn the course lab handouts into a book (which means adding everything that was previously just in lectures), and I’m trying to rearrange the lab schedule to fit better into the 10-week quarter and to flow a little better pedagogically. In this post, I’ll ignore the lecture component, but just look at a possible reordering of the labs. Squeezing the KL25Z soldering and both halves of the thermistor lab was too much, and the sampling and aliasing lab did not work well late in the quarter, so I’ll strip the filter design out of the sampling lab and simplify it a bit to get it in the first week, and move the thermistor lab fully to the second week. I’ll have to squeeze somewhere else, and I think that the best bet is the hysteresis lab, which took far longer than it should have. I still want to have data-analysis Wednesdays, and reports due on Fridays. Tuesday week 2 Measuring input resistance of multimeter, and of oscilloscope. measuring thermistor resistance at many temperatures. Thursday week 2 Measuring voltage of thermistor voltage divider, recording voltage vs. time. Tuesday week 3 Measure I-vs-V DC characteristic of resistor and of electret mic, both with multimeter and with KL25Z board. Thursday week 3 Look at mic with resistor load on oscilloscope (AC & DC coupling). Filter design for AC coupling. Loudspeaker on function generator? Thursday week 4 Characterize hysteresis in Schmitt trigger chip using data logger. Breadboard hysteresis oscillator with various R and C values, measuring frequency or period (oscilloscope or frequency meter?). Make and test touch sensor with breadboard oscillator. Solder hysteresis oscillator. Estimate capacitance of touch from change in period of hysteresis oscillator. Tuesday week 5 Impedance of stainless steel (polarizing) electrodes in different NaCl concentrations (at several frequencies). Thursday week 6 catchup day? characterizing photodiode or phototransistor? Thursday week 7 Pressure sensor day 2: further debugging. Recording pressure pulses from blood-pressure cuff. Tuesday week 8 Photodiode or phototransistor with single-stage simple transimpedance amplifier. Freeform soldering to attach leads for fingertip transmission sensor. Thursday week 8 Fingertip pulse sensor with 2-stage amplifier and bandpass filtering. Thursday week 10 EKG day 2: soldering, debugging, and demo. Last day for any catchup labs. I’m not really comfortable with the class-D amplifier in the week with Memorial Day. I’ll have to double check when Memorial Day comes next year. As I reported last week, students did poorly on the first quiz, which came as no surprise to me. I had the students redo the quizzes as homework, allowing collaborative work (as long as they acknowledged the collaboration in writing). They turned in the homework on Monday, a week after the quiz, and I returned them today. No one aced the redo, with the top score being still only 25/33 (which would have been an A on the first pass, on a redo maybe a B+). A lot of the students still seem to be having trouble with complex numbers—they got the formulas right when working symbolically, but then the exact same question with numbers instead of letters (which could be done by just plugging into the formulas) came out with real numbers when complex impedances were asked for. Also, a lot of sanity checked were skipped (several people reported a battery as doubling in voltage when hooked up to a resistor, for example). These students are not major mathphobes (they’ve all passed a couple of calculus classes and most have done more math past that), but they don’t seem to have any sense for reasoning with or about math—they just want to plug in and grind, even on simple problems like ratios in voltage dividers. This class has almost no memory work (I gave them a one-page handout at the beginning of the year with all the math and physics I was expecting them to memorize), but relies heavily on their being able to recognize how to apply those few facts. This often requires subdividing a problem, like recognizing that a Wheatstone bridge is the difference between two voltage dividers, or that a 10× oscilloscope probe is a voltage divider with R||C circuits for each of the two impedances. Determine the pressure level of 60dB sound in Pa. Convert to A/Pa given resistance of I-to-V conversion resistor on spec sheet. Determine voltages needed for op amp power supply. Determine I-to-V resistor needed to bias microphone in saturation region. Convert A/Pa sensitivity, RMS pressure level, and I-to-V resistor to RMS voltage out of microphone. Determine corner frequency and R, C values for DC-blocking filter. 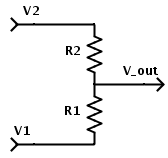 Choose resistor values to give the desired gain. I’m hoping that pushing them go through these multi-step designs in the lab will give them more practice at decomposing problems into smaller pieces, so that two-step problems on a quiz no longer seem daunting, but routine. I’m going to be giving them another quiz in about a week, covering op-amp basics and the amplitude response of RC filters. I’ve got to figure out the best time to do this—possibly a week from Friday, after they’ve done another op-amp lab (using a phototransistor to make a pulse monitor, using this handout). I think I’ll reorder the labs after that, doing the pressure sensor instrumentation amp lab, then the class D power amp, then the EKG. I gave about the same quiz as I did last year, changing the numbers, removing one of the harder questions, and making sure that some of the other questions reflected worked examples we had done in class. The quiz was again on the 12th day of instruction. I had intended to move it to the 10th day, but one of the students was called out of town, so I rescheduled it so that everyone could take it at the same time. I expected similar distribution to last year’s (last year the range was 3/32 to 12/32), but was hoping for slightly better. I saw a distinct bimodal distribution this year, with half the class getting scores from 0/33 to 6/33 and the other half getting 11/33 or 12/33. This is a little clearer distribution than last year’s, which spread the students out more uniformly. I was still hoping that some of the better students would get over half the points on the quiz, but they seemed to top out at 36%. I worked this year’s quiz myself in about 24 minutes (which means the quiz was a little too long still—I want about a 3:1 ratio on time, and the students had only 70 minutes). There were a few questions that should have been free points (like asking for the impedance of a resistor with resistance R)—I was disappointed that some students missed even the trivial questions. I had a pair of questions which were identical, except that one asked for algebraic formulas for impedance and the other gave component values and asked for numbers. I put the algebraic ones first this year, so the numeric ones were just a matter of plugging the numbers into the algebraic ones (and doing a sanity check). The algebraic ones had a mean score of 2/4 with a standard deviation of 1.2, while the numeric ones had a mean of 1.22/4 and a standard deviation of 1.2. I had not expected a drop in performance on the numeric ones, since the received wisdom in the physics education community is that students do better with numeric examples than algebraic ones. No one got any points on the oscilloscope probe example, even though it was identical to an example we had worked in class. The average score on a load-line problem was 1/6 with a standard deviation of 1.3. This did not look like a normal distribution, but an exponential one, with half the class getting no points. I had two low-pass RC filter questions. One asked for algebraic formulas; the other used the same circuit but asked for numeric answers using specific component values, voltages, and frequencies. The algebraic one was bimodal, with 2/3 of the class getting 0 and 1/3 getting the answers completely right. The numeric one was significantly worse, with only 2 out of 9 students getting any points (1/6 and 3/6). I asked a couple of voltage divider questions that required applying the voltage divider formula circuits in which the voltmeter was connected between two nodes, neither of which was ground. One asked for an algebraic results (a Wheatstone bridge), the other for a numeric result (voltage across the middle resistor of three in series. Students did very poorly on both, with only one person getting the voltage for the middle resistor (one got half credit for setting it up right, but computing wrong), and no one getting more than 1/5 for the Wheatstone bridge. I could tell them to study and give them another quiz. That would be totally useless, as it would just repeat the problems on this quiz. They don’t know what it is that they need to know, and vague exhortations to study are pointless. I don’t think the problem is lack of effort on their part, and that’s the only problem for which pep talks are a potential solution. I could go over the quiz question by question, explaining how I expected students to solve them. This is classic lecture mode and the approach I used to use. It would be easy to do, but I doubt that it would help much. I already did an interactive lecture on the material, and another approach is now needed. The students could get the quiz back and be told to go home and look up in their notes and on-line anything they did not get right. They would find and write down the right answers, as if this were homework. (This “quiz correction” is a standard strategy in high school teaching, but not common in college teaching.) One difficulty here is that they might be able to find answers (say by copying from other students in the class) without understanding how to do the problems. It is probably a better approach than yet another lecture, but I’m not sure it will work well enough. If the students were trying to get from 80% understanding to 95%, it might be fine, but to get from 30% to 80%, something more directed is needed. More time and open notes would help, but maybe not enough. I could break them into groups and give each group a couple of the problems to work on together in class. This peer instruction technique would be a good one if about 1/2 the students were getting the problems right, but with the top of the class getting only 1/3 right, I may need to give them more guidance than just setting them loose. For example, on some of the problems there was a fundamental misreading of the circuit schematics that was very common. I could clear up that misunderstanding in a minute or so and have them rework the problems that depended on it. Then I could send them home to write correct solutions. I could give out lots of problem sets to drill them on the material. Of course, since it took me more than all day Sunday to make an 8-question quiz, it would take me forever to generate enough drill problems to be of any use. I feel the same way this year about the possible teaching strategies, but this year I’m going to try a mix of methods 3 and 4, asking them to redo the quizzes at home, working with others until they are satisfied that they can now do the problems and other similar problems when asked. I’ll have them hand it in this year as a homework, but not go over it in class until after they turn it in. They need to take a more active role in trying to master the material, and not rely so much on my telling them what to do. Monday we’ll cover inductors and loudspeakers, in preparation for the Tuesday measurement lab. On Wednesday I was planning to do gnuplot analysis of the loudspeaker data, but I think I’ll keep that fairly short, so that we can get an intro to sampling and aliasing also before Thursday’s lab. I have to decide whether to bring in my son’s stroboscope and a moving object to demonstrate aliasing. Friday, I’ll introduce op amps, with the intent of developing the block diagram in class on Monday for a simple op amp microphone circuit for the Tuesday lab. This weekend I need to rewrite that lab from last year—I decided last year to use the dual power supply with a center ground for their first op-amp design, rather than having them build a virtual ground (we’ll get that in the next lab assignment). Anyone can redo the report to get it re-evaluated (and probably get a higher grade). No one attempted theV1 &V2 problem, so I reassigned it for Wednesday. The circuit I had given as an exercise, asking them to determine the output voltage V_out. A lot of reports mixed together two different problems:the 1kΩ–3.3kΩ problem and the optimization to maximize sensitivity of the thermistor temperature sensor. I encouraged students to use more section headers and avoid mixing different problems together. Figures should be numbered and have paragraph-long captions below each figure. I reminded students that most engineering reports are not read in detail—readers flip through looking at the pictures and reading the picture captions. If the pictures and captions don’t have most of the content, then most readers will miss it. I also pointed out that many faculty, when creating new journal articles, don’t ask for an outline, but ask for the figures. Once the figures tell the right story, the rest of the writing is fairly straightforward. A lot of the students misused “would” in their writing, treating as some formal form of “to be”. The main use in technical writing is for contrary-to-fact statements: “the temperature would go down, if dissipating power cooled things instead of heating them”. Whenever I see “would” in technical writing, I want to know why whatever is being talked about didn’t happen. A number of the students had the correct answer for the optimization problem, but had not set up or explained the optimization. Right answers are not enough—there must be a rational justification for them. In some cases, the math was incomprehensible, with things that weren’t even well-formed equations. I suspect that in many cases, the students had copied down the answer without really understanding how it was derived and without copying down the intermediate steps in their lab notebooks, so they could not redo the derivation for the report. A number of the plots showed incomplete understanding of gnuplot: improperly labeled axes, improperly scaled axes, plots that only included data and not the models that the data was supposed to match, and so forth. I pointed out the importance of sanity checks—there was no way that anyone ran their recording for 1E10 seconds! I was particularly bothered that no one had plotted the theoretical temperature vs. voltage calibration based on the parameters from their temperature vs. resistance measurements, so I could not tell whether the voltage divider was doing what they expected it to. No one really got the solution for the 1kΩ–3.3kΩ problem perfectly. A number of them set up the equations right and solved for R (getting 2.538kΩ), but then not figuring out what Vin had to be. It turns out that Vin depends strongly on R, so rounding R to 2.2kΩ or 2.7kΩ results in different good values for Vin, and the 2.2kΩ choice gives a more desirable voltage (around 3.3v, which we have available from the KL25Z boards, as it is a standard power-supply voltage). I also showed the students how I had expected them to setup and explain the optimization to maximize sensitivity at a particular operating temperature. After that feedback, I started on new material, getting the explanation of amplitude, peak-to-peak, and RMS voltage. I think that the RMS voltage explanation was a bit rough. I was deriving it from the explanation that we wanted a measurement that represented the same power dissipation in a resistor as the DC voltage, and I got everything set up with the appropriate integrals, but I forgot the trig identity , and ran out of time before I could get it right. I did suggest that they look up the trig identity and finish the integration. I had hoped to get at least partway into Euler’s formula, complex sinusoids, and phasors, but the feedback took longer than I had expected. Those topics will have to wait until Wednesday or even Friday, since Wednesday we’ll want to do the modeling of the DC characteristics of the electret mic, and talk about how the mic works.